Play with the sound of a full cathedral organ, created by award-winning sound designer Kurt Ader! This app is designed as professional sound module for your iPad by connecting external MIDI keyboard(s), using the Apple USB camera adapter or another adapter supported by Apple¹. This app supports Apple's Audio Unit v3 plugin standard (iOS 9 or higher), Audiobus, Apple's Inter-App Audio system, as well as the JACK Audio Connection Kit (up to iOS 6.1.3) for audio & MIDI connections from/to other audio apps, as well as Bluetooth LE MIDI ! iCathedral Organ generates the sound of a lovely and color rich pipe organ of a real cathedral. All 28 individual stops of such a pipe organ were recorded in state-of-the-art quality to resemble this sound as realistic as possible. You can fully control all individual organ stops in real-time, simply by rotating the respective knobs, to create your own sounds and save them as your personal sound presets. 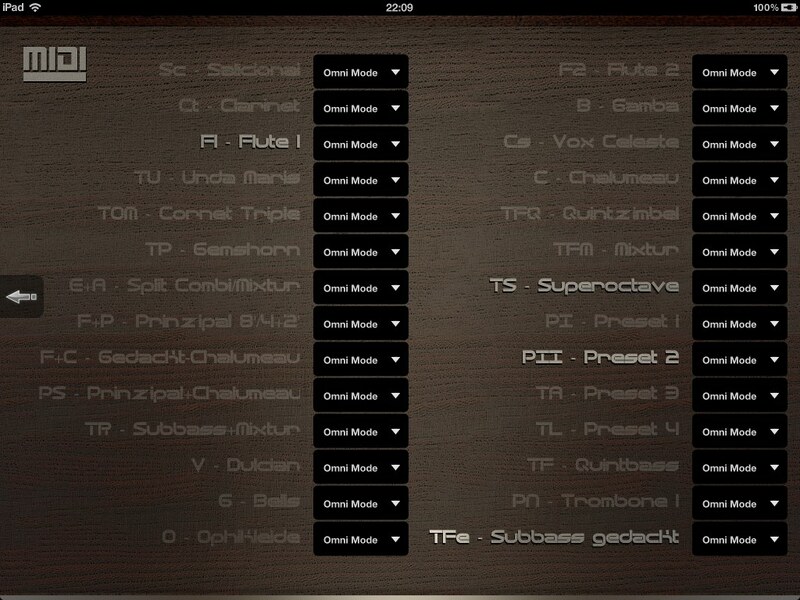 Or simply select one of the factory sound presets to play impressive organ sounds right fromt the start. The sounds of this app were once again created by Kurt Ader, awarded as sound designer of the year at the NAMM 2015 winter show! Official trailer video of iCathedral Organ. 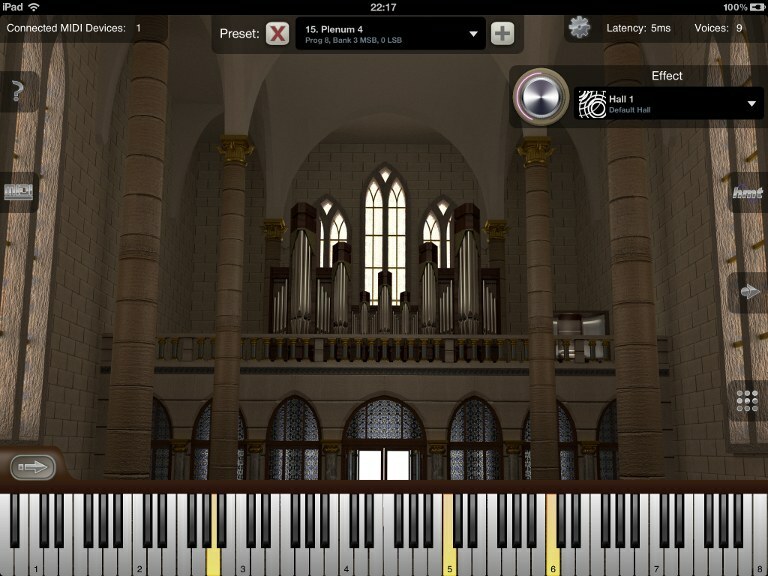 iCathedral Organ was designed as intuitive iOS app for your Apple iPad. Simply connect one (or even several multiple MIDI keyboards and MIDI controllers if you will) with your iPad and enjoy playing a stunningly realistic pipe organ. Even though iCathedral Organ allows configuring various aspects, there is no configuration whatsoever required though to use and play it immediately. Along to the factory presets coming with this app, you also have the option to create your own presets. Just setup sound and settings to your needs, tap on the plus button on top of the screen and enter a name for your own new preset. You may also assign MIDI program change and bank numbers to your presets. That way you may switch between presets directly with your external MIDI keyboard during live performances, without touching or even looking at your iPad. 28 individual organ stops, each one controllable simultaniously in real-time. App can keep running in the background, so you can play on your keyboard while e.g. using Safari or another app to display scores or while using other audio apps at the same time. Supports Bluetooth LE MIDI devices for playing with wireless MIDI keyboards. Virtual on-screen piano keyboard, scalable & scrollable. 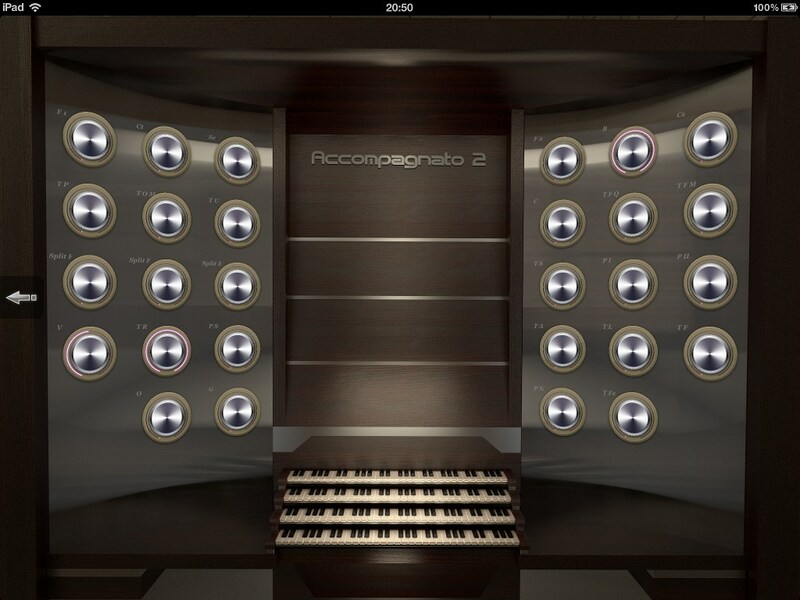 iCathedral Organ was designed as professional virtual organ sound module. Accordingly it allows you to play it with external MIDI equipment. By default the app simply listens to all MIDI devices connected to your iPad on all MIDI channels (Omni Mode), that way you can immediately play with an external MIDI keyboard without requiring any configuration at all. You do have though various options to adjust the MIDI setup of iCathedral Organ to your specific needs as well. For example you may want to connect two or more external MIDI keyboards with your iPad and define which organ stops shall be controlled by which one of the external keyboards. Since there are a lot of organ stops in this app, the stops which are currently enabled are highlighted by the app for you. That way you will never get confused about which stops you need to route with your keyboards for your current sound. Your MIDI setup will automatically be saved and restored with new sound presets you create. That way you can easily restore entire application states and switch between them quickly during performances, without wasting one thought about setup issues. You are on the road with no "real" MIDI keyboard around? No problem, just scale the virtual on-screen piano keyboard with two fingers to the size preferred by you and scroll it with one finger to the keyboard section or octave you want to play on. The resize and scroll features were implemented in a way which never will occur accidently while you are intending to play notes on the virtual keyboard. iCathedral Organ includes support for Hermode Tuning, which makes the sound even more brilliant by controlling the pitch of the notes slightly and gently in multivoiced music in real-time for achieving better frequency ratios than with fixed tuning. This dynamic tuning algorithm imitates the tuning behavior of well educated musicians of i.e. orchestras and choirs. You can enable and disable Hermode Tuning at any time and you can fine tune the impact of its frequency corrections. 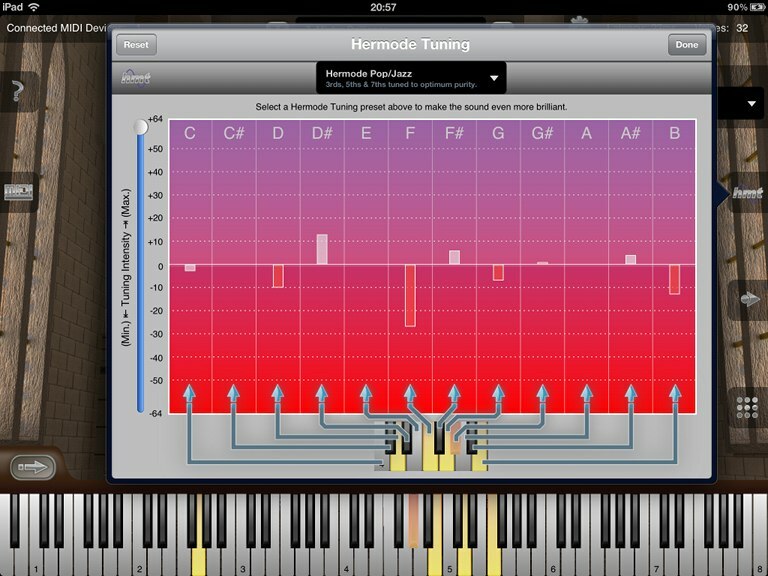 The Hermode Tuning screen is also an excellent tool for learning or teaching this professional playing technique with real life instrument players and singers, since you are able to watch how Hermode Tuning adjusts the individual active notes in its frequencies and in which degree. Load your favorite songs as MIDI (.mid) files from the Internet, and watch at the virtual keyboard how to play them. And there is more about user presets to be mentioned here: The sound presets you create also save the MIDI song which you are currently using. This allows you to automatically load MIDI play-alongs which will assist you during live performances, and that simply by restoring a sound preset. You are however not limited to the built-in MIDI player / recorder of course. If you prefer, you can also use any other third party Inter-App Audio capable sequencer or Digital Audio Workstation (DAW) app like i.e. Apple's Garage Band for recording your organ playings or simply for using iCathedral Organ as virtual instrument in your favorite Inter-App Audio (IAA) host app. Appropriate polyphony is automatically detected and selected for your specific device model by the app for you. If desired however, you can override the polyphony setting manually in the app's settings screen. For example to save CPU head room for other audio apps that you might be running in the background simultaniously. Minimum requirement for using iCathedral Organ is an iPad 1st generation. However due to the very limited amount of polyphony that can be achieved on an iPad 1, we recommend to use an iPad 2nd generation or higher with this app. Please Note: This app requires quite some hardware resources from the device. In case there are problems with this app, please close apps in the background by double pressing the device's home button, the list of active apps appears on the bottom of the screen, tap and hold one app icon in the list, then press the respective app icon "minus" corner to quit those apps. iCathedral Organ is currently available for the following mobile devices. In case you encounter any problems while using this app, please report it to us by using the feedback link above. You can get iCathedral Organ through iTunes from the Apple App Store. You need at least iOS 4.3 or later to be able to use this app. You have questions about iCathedral Organ? Don't hesitate to write us by using the feedback link above.